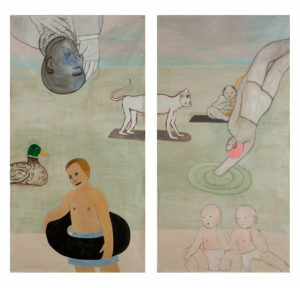 James Harris Gallery | Fay Jones: "Water"
James Harris Gallery is pleased to present our first solo exhibition by Fay Jones. This show titled “Water” focuses on works on paper, the core of the artist’s practice. Jones’ work usually centers on the world around her as she develops ideas and personal iconography based on family, friends and experiences. 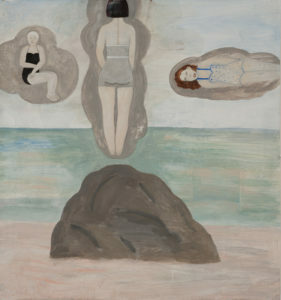 Her works on paper have always been rooted in a psychology of the mind. 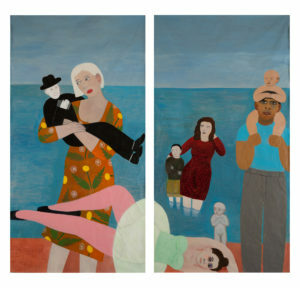 For over 45 years, Fay Jones has created a body of work that is explicitly representational and highly autobiographical. For the artist, painting is an intimate act and an expression of her relationship to the world. Jones uses figures that are described with line and color rather than modulation. Her figures are staged on flat planes of color to create a stylized illusion of depth. 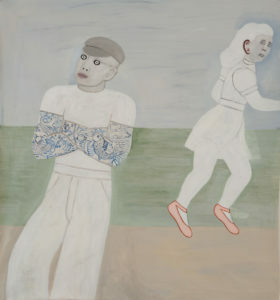 This signature style creates a tension between the immediacy of the simplicity of Jones’ figures and inscrutability of what she is depicting. The artist hones in on a telling gesture or pose in her paintings in the form of outlines and silhouettes, or flat doll-like renderings. The individual characters often have mask like gazes lost in deep private thoughts. Her work explores our collective and individual responses to representation and memory, and creates a psychological dance that is playful, thought provoking, and iconically Jones. The exhibition is divided into two galleries. 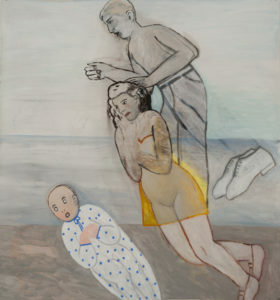 On view in the first gallery are six works depicting beach scenes, a recurring theme in her work. Three of the pieces are large-scale diptychs, a format that the artist has been using for years to split the action, and create pause or tension in the composition. The other three works are paintings on large single square sheets of paper. Jones’ early family life was complex, and elements of this experience are often reflected in her paintings. Growing up on the East Coast, she frequently spent summers on the beaches near Boston. The memories from this time are the impetus for the composition and actions in all the paintings in this gallery. In the diptych, “The Monkey Makes No Waves” a figure plunges into the water, her back turned toward the viewer. A young boy with an inner tube around his waist wanders on the beach with a mask-like gaze, two babies sit on the shore alone in their own world while a large head of a man whispering into his hand hangs from above. Also populating the scene are images of a duck, a monkey, and a Buddha shaped figure. Uniting the diptych is Jones’ signature monkey, referencing Seurat’s work “A Sunday Afternoon on the Island of La Grande Jatte”(1884-86). The monkey has always been a signifier for mischievousness and in the 18th century, Watteau popularized the idea of “the artist as ape.” Jones also sees these symbols as a way to tie her figures together in a psychological landscape where meanings lead to a shifting narrative. On view, in the second, more intimate gallery is a triptych entitled “The Bridge, The Landscape and The Duchess.” This work incorporates art historical elements from different cultures, while connecting to Jones’ present day home. The left panel consists of the artist’s interpretation of a Hiroshige print passed down to her by her mother; the central panel is a view out of her and her husband’s bedroom window; the right panel is made up of a recreation of a sculpture by fellow artist Akio Takamori, based on the Duchess of Alba, by Goya. Although loosely connected to water through the reference to the Hiroshige print, this work is decidedly different in subject matter. 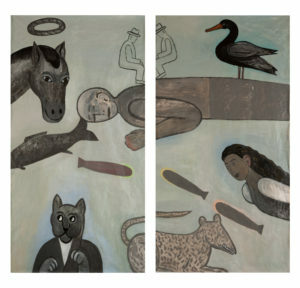 Jones’ gives the viewer a glimpse into her personal world. Whereas the other six works are imbued with a psychological narrative based on memory, “The Bridge, The Landscape and The Duchess” is firmly rooted in the everyday reality of her personal being. Like the other pieces this exhibition, this painting is a diaristic record where visual fragments gives the viewer insight into Jones’ mind and world.